The Sonicaid Doppler Huntleigh Diagnostics managed to reach the top of the market for their sensitivity, reliability and design. 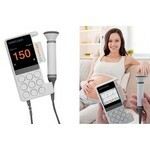 You have the most complete range of obstetric Doppler in which you will find what you are looking for. These devices known for many years, constantly evolving: the sensor sensitivity was further improved for fetal detection even easier even during early pregnancy or mother with a high BMI.